Gloria Danvers believes that there are two reasons a woman's body is one of the most intriguing canvases an artist can work with. One, because, unlike any other medium, it is in constant movement and any Art created for the body must be in sync with that movement. 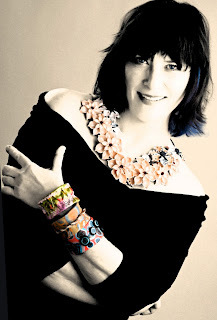 It is her own evolution in life and her constant re-invention that inspires Gloria to design jewelry and accessories. "Jewelry helps one define and interpret who she is, and also sends signals to the world that she knows who she is and is aware of how she presents herself." "I have reinvented myself over and over in my life, and my vision of myself has changed accordingly. My jewelry reflects those changes, both in the creating, and the wearing." a good piece of jewelry is conceived from the inside out, and it is the invisible infrastructure that the jeweler creates that allows the artist free reign of whimsy. Drawing on her many years of experience as a jeweler, an artist and fashion designer has allowed her to combine many mediums styles and techniques to create her signature Art to Wear pieces. She will most often start with a polymer clay sculpture, always keeping in mind that it must be in harmony with the rest of the components of the finished piece, and with the body itself. These hand sculpted pieces, when combined with stones, pearls, fossils and other media, create a certain and look and style that is pure signature piece. This type of jewelry sends a subliminal message to the observer that this woman is daring, bold, yet very playful. Her pieces are elegant, but they don't take themselves too seriously. They make a statement without being aloof, They say "Yes, this woman is someone to reckon with, artistically, but she is approachable and fun"! The woman Gloria Danvers is in partnership with artistically is a the woman who is comfortable in her own skin. She believes there is nothing more beautiful in this world than the living breathing synergistic partnership between this woman and her jewelry.